Last night’s debate was hugely successful, with a full house and lots of thought-provoking comment, and it’s with great pleasure that we can share the speeches given by our panel members. From Baroness Cox’s opening remarks on FGM, child sexual abuse and religion’s part to play in monitoring and addressing these concerns, to Rabbi Romain’s rousing speech on the responsibility of religious leaders to come together and explore the reasons behind this kind of behaviour, you’ll find a wide array of interesting and inspiring thought. We hope you enjoy the speeches. 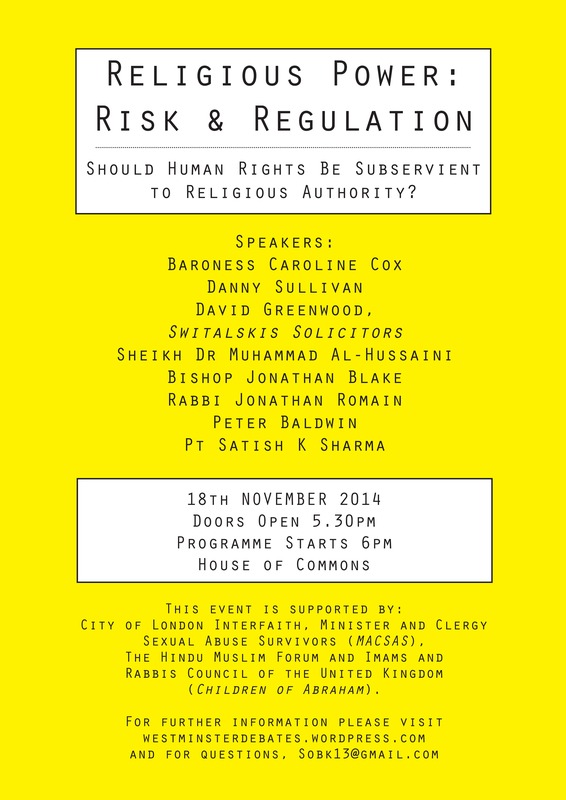 We now have a lovely poster for our event on the 18th November, “Religious Power: Risk and Regulation”, which will look at religious authority, its regulation and the extent to which that regulation has failed to safeguard against human rights breaches involving child sexual abuse and exploitation. Welcome to our next event, which takes place on November 18th in The House of Commons. The debate, “Religious Power: Risk & Regulation”, will examine religious authority, its regulation and the extent to which that regulation has failed to safeguard against human rights breaches in the UK. The rise in child abuse cases within a Faith context in the UK has been startling. With the onset of several high profile cases each detailing alarming levels of abuse nationwide, this debate asks: what are the reasons behind these worrying developments and do our religious organisations in the UK have the tools and the structures in place to safeguard against phenomena like child sexual abuse, FGM, forced marriage and grooming in all its forms? In line with the government’s inquiry into child abuse, this debate seeks to explore the issues above and inform the inquiry by providing a platform for evidence gathering and discussion. This Westminster Debate is co-hosted by City of London Interfaith, Minister and Clergy Sexual Abuse Survivors (MACSAS), The Hindu Muslim Forum and Imams and Rabbis Council of the United Kingdom (Children of Abraham). The debate starts at 6pm and is an open event, so if you would like to attend, please call Natasha on 07769 647 983, or email Natasha at Sobk13@gmail.com to reserve your seats. Thank you. If you are attending, please remember that it may take up to 30 minutes to pass through Security at The House of Commons. In today’s Guardian newspaper we are told that there may be a risk of yet more riots by The Riots Communities and Victims Panel, which was created to look at the riots and examine the causes for them. The Panel set to work trying to find out the causes for the unrest and heard reasons ranging from the need to steal trainers to “a desire to attack society“. As our Westminster Debate on the riots draws closer, now is the perfect time for family law professionals, members of government and key stakeholders to take some of that responsibility and help work towards creating the ultimate system, which can help to tackle many of those underlying problems (which will not go away regardless of how vigilant our police force becomes or how efficient we become at punishing members of our society) and to help give children the support they deserve. 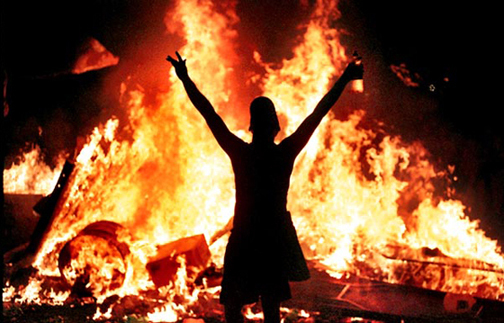 Social exclusion is spreading and the possibility of more riots looming over the horizon are simply symptoms of a deeper problem. If you would like to attend our debate, please leave your name and contact details below and we will send you an invite. Welcome to our next debate, which takes place on December 12th in the House of Commons and looks at the ways in which the family justice system can support families in meaningful ways after the riots and what the riots mean to both the system and parents and children in the UK. You can click on the Riots link above in the directory or place your cursor over it to see a drop-down menu with all the information on this event, which is constantly being updated. Orrrrrr, you can allow us to do the work for you and simply click on the links below! It is an open event which means that anyone can come along; so, if you would like to attend, just post your email address below and we’ll send you an invite. We hope you’ll be able to join us – it should be a fun and thought-provoking evening. The All Party Parliamentary Group on Family Law and The Court of Protection’s web content has now moved to its permanent home. Please don’t be shy about coming over and taking a look! And for interactive comment on The Group’s activities, Researching Reform will still be blogging away and listening. On Monday 18th October, Baroness Deech addressed the House of Lords in a closed debate, on matters relating to matrimonial finance and what she felt was the way forward. In an opening speech which focused on London’s reputation as Divorce Capital of the World, Lady Deech asked Their Lordships to consider laying down the groundwork for a set of fair and established principles for ancillary relief before going on to look at further possibilities, like mediation, in order to make financial dispute resolution more effective. Baroness Deech also goes on to explain what she feels are the solutions to those problems. You can read this very interesting debate, here. Birgit Cunningham of Babies for Justice has kindly allowed me to post up her footage of the debate. That’s right, you can see us all in motion. Ay,ay,ay….. Many thanks to Birgit for this. You’re invited to the After Party! Didn’t get the chance to come to the debate? Didn’t want to leave home? Now you don’t have to…. the debate is coming to you and our series of After Party podcasts are just the ticket. Sit back, relax and listen to guests and panel members tell it like it was.